I’ve been sharpening my knives on the same Japanese water stones for a dozen years now. Despite my best intentions, I do not always use the full length of the stones. Somewhere in the back of my mind I have always been concerned about dishing the stones. Last month I took a sharpening class at Bernal Cutlery, which was the first hands-on instruction I’ve ever had in the subject. 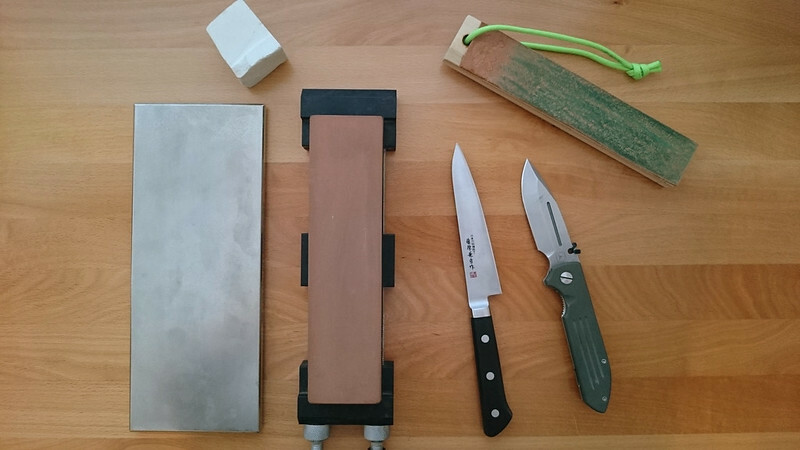 One of the things I learned was that there are other stones that can be used to flatten sharpening stones. After the class I purchased a 95-micron DMT Dia-Flat Lapping Plate. It only took 30 seconds or so for it to flatten my water stones. Either it works extremely well or my stones were not as dished as I thought they were. After using it, there was a very obvious improvement in how the stones sharpened. More than I would expect just from flattening them. It makes me think that perhaps the pores of the stones had been clogged from years of use, which was addressed by removing the top layer of material with the lapping plate. The lapping plate is certainly not cheap. I’m sure that they do not last forever for professional sharpeners, but given how frequently I use my stones I think the lapping plate falls into the buy-it-once-for-life category. It has extended the life of my water stones, which I think makes it a justified expense. This post was published on 2017-07-15 . It was tagged with knife.